Crisp E-Liquid dedicated to delivering their customers flavors that are out of this world with flavor. Crisp E-Liquid is manufactured by the vape gurus from the classic vape industry brand Cosmic Fog, and crafted in an FDA approved facility. All of their vape juices have gone through months of testing to make sure that they are perfect enough for their customers. Crisp E-Liquid Honey Suckle brings you the taste of strawberries drenched in delectable honey. This vape juice is something has so much flavor that you will not believe your taste buds. As you inhale Crisp Honey Suckle, the taste of strawberries floods your taste buds with the same flavor that real strawberries. As you exhale, the honey flavor combines giving you one last hint of sweetness. 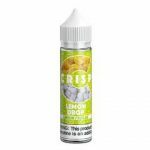 Crisp Lemon Drop brings you the taste of your favorite lemon candy. This vape juice has just the right amount of tartness and sweetness to have your taste buds going crazy. as you inhale Crisp Lemon Drop, the taste of candied lemons flood your taste buds causing your lips to pucker. As you exhale, the candy flavor comes through in full washing away any trace of the tartness leaving your palate craving more. Who would’ve thought to combine the mouth-watering taste of succulent strawberries and juicy tangerines? Crisp Strawberine brings you this jaw-dropping combo. As you inhale Crisp Strawberine, the taste of succulent strawberries flood your taste buds most deliciously. As you exhale, the tangerine flavor fuses together with the strawberry creating a taste out of a fantasy. Crisp Rango brings you the taste of raspberries and mango that brings you a flavor fusion that you will never be able to forget. As you inhale Crisp Rango, the flavor of slightly tart raspberries hit your taste buds causing them to tingle. As you exhale, the mango merges with the raspberries to create a sweetness that will wash away any of the tartness leaving your taste buds soaked in sweetness. Crisp E-Liquid brings you flavors that you will love from your first puff. These flavors are the best fruity fusions that will have you drooling in seconds. Don’t miss your chance give Crisp ejuice a try to find your new favorite vape juice.